MAG254/255 is a powerful Set-Top Box with efficient processor STiH207 and increased RAM memory, and it is an optimal solution for OTT projects. The Set-Top Box is designed to fulfill business projects of internet providers, OTT operators and content aggregators. The increased productivity of MAG254/255 enables to use resource-intensive interactive applications and support 3D-video. STiH207 650Mhz, Linux 2.6.23, Composite AV, HDMI 1.4, USB x 2, S/PDIF, LAN, WiFi Ready Standard set - MAG254/255 Set-Top Box, HDMI cable, remote control, 2 AAA batteries, packaging, US Power adapter 12 V 1 A, User manual. MAG256/257 is a high-performance Set-Top Box solution with new STiH301 chipset. The STB is using HEVC technology for provision of high quality video with more velocity. Owing to enhanced capabilities of MAG257 Set-Top Box, it became possible to playback the video of quality up to FullHD and to use intensive applications. Faster and more powerful media processor ARM Cortex A9 1.5 GHz; HEVC support; USB 2.0 and USB 3.0 ports to connect external carriers and Wi-Fi adapters. MAG256/257 Set-Top Box, HDMI cable, remote control, 2 AAA batteries, packaging, US Power adapter 12 V 1 A, User manual. Meet the evolution of MAG254. MAG322 is a powerful set-top box containing a high-performance processor on the BCM75839 chipset, and 512MB RAM. Its the optimal solution for quick launch of your OTT project. The set-top box is designed to fulfill current market needs. Your customers can enjoy the highest video and sound quality with HDMI 1.4b and S/PDIF (optional) outputs. HEVC support will dramatically reduce your network load. MAG254 and MAG322 are fully compatible with the MAG JS API BCM75839, Linux 3.3, OpenGL ES 2.0, HEVC, 2 USB 2.0. MAG322/323 Set-Top Box, HDMI cable, remote control, 2 AAA batteries, packaging, US Power adapter 12 V 1 A, User manual. MAG 324 / MAG 325. The cost-effective solution for your OTT project with a full set of functions. MAG324/325 is a basic set-top box on a Broadcom chipset that supports HEVC compression. The device, therefore, runs quickly and with minimal network load. Through its HDMI 1.4b output, you can enjoy high-quality video. We have also completely changed the case and remote control design, making it more ergonomic and easier to use. BCM75839, Linux 3.3, OpenGL ES 2.0, HEVC, 512 MB Flash/1 GB RAM. MAG324/325 Set-Top Box, HDMI cable, remote control, 2 AAA batteries, packaging, US Power adapter 12 V 1 A, User manual. MAG351/352 is a premium OTT Set-Top Box for operators, providing TV services via IP networks. Main advantage of the MAG351/352 is 4K standard support that will give your subscribers an opportunity to watch the video in the best quality. In turn, the 2 GB of RAM and Broadcom chipset with 10 000 DMIPS create extra velocity. 4K support; HEVC support; Super-power media processor with Broadcom chipset and 12 000 DMIPS productivity; 2 Gigabyte of RAM; In-built dual-band Wi-Fi 2.4GHz/5GHz(ac)(optional) and Bluetooth 4.0 adaptors. MAG351/352 Set-Top Box, HDMI cable, remote control, 2 AAA batteries, packaging, US Power adapter 12 V 1 A, User manual. UHD Set-top Box for Android. Is the first next-generation model of cost-efficient UHD STBs from Infomir. The device runs on Android OS and fully meets the most stringent requirements of the OTT market. This high-performance STB is powered by a quad-core Cortex-A53 CPU and comes with 2 GB RAM and 8 GB Flash on board, which enable it to easily play and store high-definition videos. HEVC support makes it possible to dramatically reduce the network load even while transferring large data amounts. MAG410 is also equipped with 3 USB ports and an integrated Wi-Fi module. 4K and HEVC support, built-in Wi-Fi module (b/g/n 1x1), OS Android 6.0.1, 2 GB RAM, 8 GB Flash. 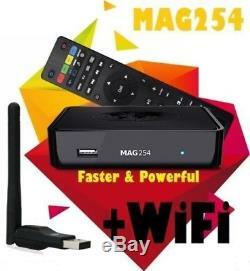 MAG410 Set-Top Box, HDMI cable, remote control, 2 AAA batteries, packaging, US Power adapter 12 V 1 A, User manual. The item "Set-Top-Box BRAND NEWMag 254. Mag 254 W1" is in sale since Friday, January 12, 2018. This item is in the category "Consumer Electronics\TV, Video & Home Audio\TV, Video & Audio Accessories\Remote Controls". The seller is "user1088818" and is located in Van Nuys, California. This item can be shipped to United States, Canada, United Kingdom, Denmark, Romania, Slovakia, Bulgaria, Czech republic, Finland, Hungary, Latvia, Lithuania, Malta, Estonia, Australia, Greece, Portugal, Cyprus, Slovenia, Japan, China, Sweden, South Korea, Indonesia, Taiwan, South africa, Thailand, Belgium, France, Hong Kong, Ireland, Netherlands, Poland, Spain, Italy, Germany, Austria, Bahamas, Israel, Mexico, New Zealand, Philippines, Singapore, Switzerland, Norway, United arab emirates, Qatar, Kuwait, Bahrain, Croatia, Costa rica, Dominican republic, Uruguay, Viet nam, Saudi arabia, Ukraine, Malaysia, Brazil, Chile, Colombia, Panama, Trinidad and tobago.